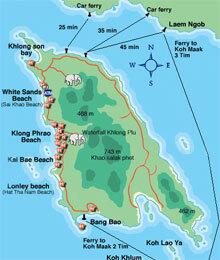 Koh Chang is a large island about 30 km long, almost 14 km wide and covers an area tootling 217 square kilometres. Small towns and beaches are dotted around the islands coastline and are connected by a single road. The road runs around Koh Chang hugging close to the coast line, except in the south where the road has yet to be completed. This makes travelling to the east coast awkward and must be done by first travelling north. Internal parts of Koh Chang are covered in dense rain forest with, fruit orchards and rubber plantations interwoven in to the landscape. There are no towns or villages in Koh Chang's interior. There are a few pleasant tracks for walking, trekking, bird watching and enjoying Koh Chang's wildlife and landscapes. Those of you who venture along the road to the east coast will appreciate the stunning beauty of this less explored section of Koh Chang. Koh Chang's west coast is covered in pristine white sandy beaches which are the perfect place for swimming, sunbathing, snorkeling and watching some of Koh Chang's beautiful sunsets. Koh Chang's most popular and busiest beach. White Sand Beach is located to the north west of the island. Named after its white powdery sand, the beach has a gentle slope to the sea and is ideal for swimming, snorkeling and other beach activities. The beach is about 2 kilometres in length and lined by coconut trees, busy beer bars, restaurants and beach resorts. In the evening White Sand Beach becomes the focal point for party goers and diners. Bars and restaurants on the beach set out tables, chairs and comfortable seating areas allowing you enjoy the evenings entertainment or one of Koh Chang's beautiful sunsets. Music, live bands and fire throwing can be seen at many venues on White Sands Beach. A wide sandy beach flanked by a few mid range family resorts. Chai Chet beach has a small rocky cape at its northern end that curves round into a secluded bay. Chai Chet beach is less crowded than many other beaches and is an ideal beach for fishing and sunset watching. Koh Chang's largest beach, Klong Prao Beach, is divided in to 3 sections by the river estuary from Klong Plu waterfall. Much quieter than it's the neighbouring beaches Klong Prao beach is ideal for those who appreciate tranquil surroundings, gorgeous scenery and beautiful beaches. Kai Bae Beach is situated to the south of Klong Prao Beach and boasts a 2-kilometre stretch of sandy beach. Kai Bae Beach is a much more busier than Klong Prao Beach but the main road is much narrower. Kai Bae beach offers some fantastic views to some of Koh Chang's neighbouring west coast islands. Most of Lonely Beach and Bai Lan is surrounded by a rocky landscape, fringed by overhanging palm trees. At the northern end there is a small sandy beach. Lonely Beach has some stunning views of the jungle-clad mountains in the background. Lonely Beach also know as the backpacker area of Koh Chang and has a variety of accommodation, ranging from budget-friendly huts to new up market resorts. Located in the south west of Koh Chang this quaint fishing village is built out into the bay on stakes. It has become a popular tourists attraction with the visitors to Koh Chang The long pier is lined with a variety of small shops selling souvenirs, dive & fishing tour. there is also plenty of seafood restaurants offering a rich selection of fresh seafood and Thai food. The beach at Bang Bao has clear waters with rocky outcrops and corals off its shores. The Beach at Bang Bao is an ideal place to fish, snorkel and swim. In contrast Koh Chang's east coast is much less developed and life continues on this part of the island much as it always has. The coast line is mainly flat, partly overgrown in places with mangrove forests stretching out along the coast line. Most beaches are to a large degree stony but there are some small sandy beaches to be found. Located in the north between the ferry ports and White Sands beach. There are 2 beaches in Klong Son Chang Noi the larger which has a scenic cape and plenty of coconut trees and a small half moon beach that faces the mainland. Koh Chang's administrative centre, located on the north east of the island. Government Offices, the main Police Station and Koh Chang Hospital are located in Dan Mai. The Beaches here are mostly rocky and covered in mangroves. There are some pleasant jungle tracks to Nang Yom Waterfall. Nang Yom is a small waterfall with several cascades. The busy fishing village of Salak Phet is located in the far south of Koh Chang. Although Salak Phet has no beach it is located in a natural harbour and offers excellent shelter for fishing boats. Visitors are guaranteed only the freshest seafood and can sample the ways of a traditional, unspoilt Thai fishing village. There are also two smaller waterfalls in the area Klong Neung and Khiriphet. There is. also a small temple which you can visit. The landscape around Salak Khok is mostly used for fruit orchards and rubber plantations. The coast line is rocky with mangroves but you can find some sandy patches in places. Salak Khok has one of the best-preserved mangrove forests in the whole of Thailand. This is an ideal place to hire a long tail boat of a kayak and take a picnic for the afternoon. Recently, a concrete bridge has been built through parts of the mangrove forests. Visitor can find out information about the mangroves and the animals living there from informative signs posted along the bridge. The beach like its name suggests is long, flat and is flanked by several coconut plantations. It is ideal for swimming snorkeling and other beach activities. There are some patches of shallow water coral reef towards the southern end of the beach, making it one of the better sites on Koh Chang for snorkeling. There are a few affordable bungalows and cheap huts available here. The track from the village of Salak Khok to Long Beach has some stunning views of some of Koh Chang's southern neighbouring islands and across Jek Bai to Salak Phet on the opposite side of the bay. There is also a Thai Navel Memorial near to Long Beach. The memorial is dedicated to 36 Thai Sailors who lost there lives in the French/Thai navel battle on 17 January 1941.